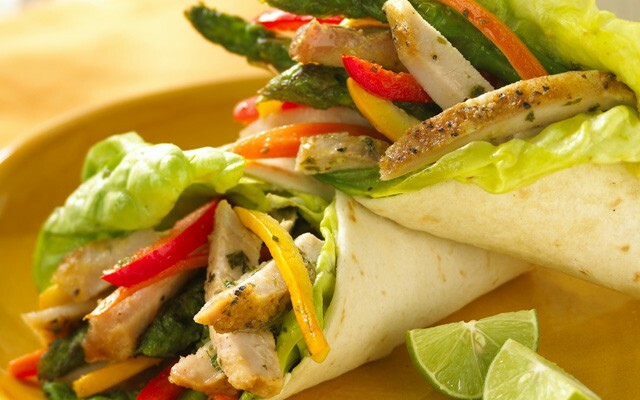 This tasty wrap provides three of the four Canada's Food Guide food groups - enjoy with a glass of milk or a yogurt on the side to get all four! Coat a large baking pan with cooking spray. Trim any visible fat from pork chops. Arrange chops and vegetables in a single layer on baking pan. In a small bowl, combine vinegar, oil, Italian seasoning, and red pepper flakes. Brush mixture on both sides of pork. Broil 5 to 6 inches from heat for about 6 to 10 minutes, or until pork is browned and vegetables are crisp-tender. Meanwhile spread each tortilla with a layer of cream cheese. Remove pork from oven and slice into strips. Divide pork pieces and vegetables among tortillas; wrap tightly before serving.